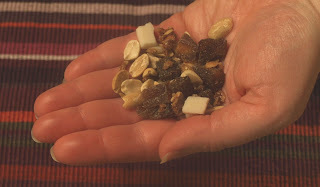 It seems a little silly to post a recipe for trail mix as it's such a simple snack and one that is infinitely variable. However, I came up with this particular blend that is a little more fancy than just peanuts and raisins and is really a treat. When making the coconut candy for this, you can use the leftover bits from cutting it with cookie cutters, or you can roll it out and cut it into squares, than cut it into small pieces. This is a replacement for chocolate chips so I was going for the equivalent size. The coconut candy does get soft if not refrigerated so you may want to store this in the fridge. I kept mine in the cupboard and didn't mind the softer texture. When I made this, I used granola that had raisins in it, so for the dried fruit I added chopped dried apricots for variety. I used peanuts but using different nuts and combinations of nuts would give this some variety. My friend Chris was just saying that hazelnuts and dried cranberries are a great combination. There are so many ways of varying this recipe, I'm sure you'll find your own favorite way to make it! You can make this ahead of time and put some in plastic baggies and you have a convenient "take along" snack food, just as convenient as the old snack bars and junk food that many of us probably used to keep around for convenient snacks on the go. It is also delicious enough to go into a Christmas stocking as a treat, especially if it were in a small tin.